The Shropshire: Will 150 Years of Our Woolliest Agricultural Heritage Be Lost? Story & photos by Montana Jones—originally published in the Rare Breeds Canada magazine Genesis. Long before I turned shepherd, whenever I heard the word “sheep”, I envisioned a rounded woolly cap, dark face and legs, black button eyes and a gentle disposition. I pictured a Shropshire. Aside from the practical reasons for raising sheep for Sunday roasts and wonderful warm sweaters, it helps to simply like sheep. And the Shropshire is a very likeable sheep. Since their 17th century origins, hundreds of thousands of shepherds have agreed. They were once the most popular breed of sheep in the United Kingdom, United States and Canada. Descendants can be traced back to 1792, where Morfe Common sheep were found grazing the rolling pasturelands of Shrewsbury in Shropshire County, England. The Morfe Common had the greatest influence in the development of the Shropshire breed – there were nearly 10,000 pastured each summer near Bridgnorth in Southeast Shropshire. It was a horned sheep with a soft back, brown or spotted face, resistant to disease. The native Longmynd also contributed to its ancestry, as well as the Cannock Chase, Whittington Heath and Clun Forest. Among the established breeds that contributed their genetics were Southdown, to breed out coarseness and horns; and Leicester and Cotswold to improve size and wool length. In 1853, the Royal Agricultural Society of England recognized the Shropshire as a breed, though they were shown before that. A breed Society was formed in England in 1882, and the Shropshire is distinguished by being the first breed ever to have a published flock book. Their popularity soared – the first Shropshire sheep to North America were imported to Virginia in 1855, and a ram and twenty ewes were brought to Maryland in 1860. In 1907, a total of 1,427 Shropshires were exported to the United States and Canada. A year later, 6,000 of the 19,545 purebred sheep in Canada were Shropshires, leading all other breeds. Up to 1919, the American Shropshire Sheep Association had registered 436,248 purebred Shropshires. To the end of 2001, Canadian Livestock Records Corporation (CLRC) had recorded a total of 121,077 Shropshires in their registry. Numbers have since fallen dramatically, with a mere 24 registered in 2002, and only 44 in 2008. A critically low number considering 12,890 various sheep breeds were registered in total. Today, the estimated number of live, registered Shropshires in Canada hovers around 140. Individual sheep listed on the CLRC sheep pedigree website are misleading as many of those animals are deceased but still listed in the database. We are dangerously close to losing a breed that likely grazed the fields of our great grandparents farms; a breed that contributed to the livelihood and success of pioneer Canada. Shropshire’s still possess these admirable traits today. They are characterized as prolific mothers, and 175 to 200 per cent lambing percentages are not uncommon. They are known for their docility, hardiness, disease resistance, easy lambing, multiple births, high milk production, high rates of gain, early maturity, meaty carcasses, quality wool, and for their hardiness and longevity. I have 12 year-old Shropshire ewes that are still lambing twins, and are among the best, most attentive mothers. Compare that record of production to the mature ewes in many modern commercial flocks that are shipped at 6 to 7 years of age. They are excellent, robust terminal sires which will service the ewes early for December lambs. Crossing a Shropshire ram with a ewe of any other breed (even an inferior ewe), inevitably results in blocky, thrifty and growthy lambs, which mature at an early age, generally exhibiting the dark face and legs of the sire. Many commercial sheep breeders wishing to breed young ewes advise using a Shropshire ram for their first time lambing, because Shropshire lambs are smaller at birth but gain quickly. In appearance, their most distinctive characteristic is a complete wool covering. A full cap of wool extends to the tip of the nose, and the fore and hind legs are wool covered down to the feet. The breed standard calls for a medium sized animal with a mature weight of about 225 pounds in rams, and 165 pounds in ewes, though the very modern Shropshires have been bred to reach weights of 250 and 180 pounds respectively. This down breed is one of the heaviest wool producers among the medium-wool breeds. The fleece is dense and elastic to the touch, light shrinking and of a quality that is readily marketable. Rams may produce fleece of 10 to 14 pounds while ewes will shear an average of 9 to 11 pounds. The fleeces have a fiber diameter of 24.5 to 32.5 microns and a numerical count of 48 to 60, with a staple length ranging from 2.5 to 4 inches (6-10 cm). During the 1950’s breeders began to divide their preferences into two distinct Shropshire types. Some British sheep farmers began to lean toward a larger scale sheep with less wool covering the face, but continued to export to the United States and Canada the short, wool covered Shropshires that were still high in demand. The North American marketing campaign for the “Shrops”, as they are affectionately called, included a slogan that boasted “Wool from the tip of the nose to the tip of the toes”. However the same woolly sheep that were so highly desired soon began to fall out of favour with the larger commercial breeders, who found it too labour intensive to manage clipping around the eyes of hundreds of “wool-blind” sheep. Homesteaders and shepherds of small farm flocks were not dissuaded, as the benefits and profit from growthy, early maturing lambs, far outweighed the minor inconvenience of the few minutes it took to trim their woolly cheeks twice a year. Eventually breeding stock was selected for more open faces, and Shrops today will be found with varying degrees in between the two extremes. Some have the woolly cheeks and cap but with an open muzzle extending up underneath the eye. Unfortunately, some of the specimens I have seen in this category seem to forego more than just their wide woolly sideburns – they seem to lose some desirable breed character as well, such as small ear size, shorter neck and leg length, and seem less like the blocky muscle mass they were bred to be. Breed characteristics in mid century were short, thick neck, well shaped head with small, well set on ears. Long-time Ontario Shropshire breeder Ed Jackson notes that if you cup your hand around a correct Shropshire ear, just the woolly tip should be peeking out. 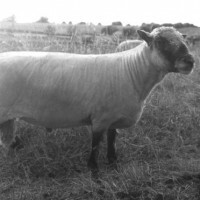 The remaining modern Shropshires of today, especially the American lines, have been greatly criticized by the older experienced breeders as having an obvious influx of other breed blood, notably Hampshire, Oxford and Suffolk. Some of the Shropshires shown in today’s agricultural exhibitions bear no resemblance to the original breed standard. They are disproportionately long-bodied, tall, racy, muscular, long necked, with the large ears and deep black face and clean black legs reminiscent of other breed traits. Beautiful sheep, to be sure, but not traditional, true Shropshires. On the spectator sidelines I’ve overheard more than one off-duty judge comment on the “three-way-crosses” in the ring. After William Miller established Shropshires in Canada, the Miller family carried on through the decades. The late John Miller and more recently his son, the late Hugh Miller, continued the tradition as prominent Shropshire breeders. Their reputation for quality livestock was widespread, they sold breeding stock to almost every state in the U.S. and throughout Canada. Rare Breeds Canada past President and Director Dr. Tom Hutchinson, had some Miller Shropshires until 2001, and played a key role in ensuring their continuance afterwards. I bought his and a few other ewes, and now have what I believe to be the very last remaining Miller line of ewes, in addition to the well known lines of Baltjes, Brien, Burnett, Comfort, Crawford, Miles, Degasparro, Emke, Jackson, Leach and Skinner lines. 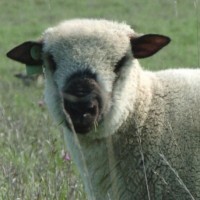 The oldest Miller ewe was 14 years old, but still healthy and fertile, attesting to their reputation for longevity. I could not locate any surviving Miller rams, until Dr. Hutchinson passed on a vital piece of information. He believed that Hugh Miller had turned the last of his flock over to his friend George Kelsey, another veteran Ontario Shropshire breeder. I visited George and Grace Kelsey, and found both tragic and wonderful news. I was too late. All of the remaining Miller ewes had succumbed to local coyotes…but, he said, “There is one ol’ boy still left, he’s running with the cows, but you can’t get near him. He’s kind of wild, and he’s probably too old to do much good now anyway.” A visit to the barnyard found a single woolly sheep, lying contentedly midst the ruminating Herefords. He had been clever enough or lucky enough to survive the coyote raids by centering himself in the middle of the cattle. Miller was the first Wholearth foundation ram. This pre-shearing when he arrived in need of a trim. The ram had not been shorn in five years – his impressive fleece actually touched the ground. 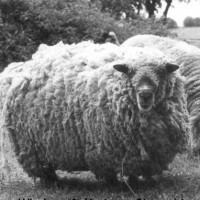 It was difficult to tell what body condition all that wool was hiding, or if he even had the conformation befitting the sire of future generations of Miller Shrops. I hoped I’d found genetic gold – the only link to the original Miller sheep—the sheep that helped lay the foundation for Shropshires in North America in 1879. George Kelsey wasn’t sure he’d still be fertile, but kindly agreed to let me take the Miller ram to spend his sunset years with ovines instead of bovines. Miller had solid conformation underneath all that wool. Once settled on my farm, the true treasure was in that first shearing. The Miller ram had all of the desirable heritage breed characteristics I’d hoped for – traits that were almost lost. Underneath those tangled locks was a solid, long, sturdy muscular body, a deep chest and impressive wide loin, shorter legs and neck, and the wool covered ears of the old heritage style Shropshires. His colouration is the correct soft brownish black (though faded with age), and he bears a solid masculine head with very broad muzzle. He has excellent angulation in his rear legs; a trait I expect will improve the faulty posty legs found in some lines of Shropshires. And he is no longer wild. In fact, he is the first sheep to seek me out for an ear rub when I enter the barnyard. Though many of the “hardened” sheep breeders may wince at this next observation – I’d even go a step up from describing him as a likeable sheep…he is quite a loveable sheep. The Miller ram seemed pleased to resume life with his own species. His transition to fatherhood was a great success, he sired 17 lambs in 2002, His progeny were without exception all solid, robust, growthy, fast-gaining lambs, and produced excellent results crossed with the non-Miller ewes as well. The fact that 17 lambs were born, and 17 were weaned, supports the Shropshire reputation for bearing healthy, vigorous lambs. These traits are common among our endangered heritage breeds – characteristics that will be lost when the breed is lost. Miller has sired almost 100 lambs to 2005, and many more “grandlambs” by his sons. 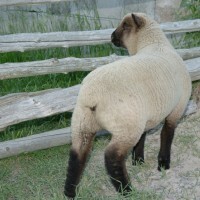 Miller became the foundation ram for the Wholearth Shropshire flock, with an ancestral pedigree tracing back to the first Shropshires imported to Canada from England at the turn of the century. The Shropshire’s future is uncertain, and though it is unrealistic to imagine they would ever resume their place as the most popular farm and commercial breed in North America, there are good reasons they’ve been so well liked. It took one hundred and fifty years of careful selection to develop their valuable traits – it would be a senseless shame to lose them now. There is still an important place in agriculture for the Shropshire – in commercial flocks, on homesteads, family farms and organic farms. It’s a good sheep. A lovely Wholearth ewe lamb. Rare Breeds Canada members Gayle and Charles Argue of Metcalfe, Ontario, have nothing but the highest praise for Shropshire sheep. “We’ve had wonderful luck with them. We have five ewes, and last spring had 13 lambs – 3 sets of triplets and two sets of twins. And the Shropshire ewes raised the triplets so easily. None of the other sheep I’ve ever had could do that.” That’s an impressive 260% lambing percentage. Charles was a full time farmer for many years and gained experience with a number of different breeds, including Suffolk’s, Oxfords, Dorset Horns, Leicester and Border Cheviots. They raise only Shropshires now. “I would never eat lamb before”, says Gayle, “I didn’t even like the smell of it cooking. But there is something different about this, I just love it.” The same response came from a dinner guest who was raving about the exceptional flavour – they didn’t believe it was roast lamb because they had always thought they didn’t like the taste of lamb.